Want to know more about my travel and travel tips? Scroll through this page for links to the in-depth details. We love Italy and our driving loop through Tuscany in spring 2008 was great fun. I wrote a separate blog to document this trip. This blog isn't written in story form, but more of a journal of what we did. We stayed at a castle and an agritourismo, too. Starting in Pisa, we saw Siena, Florence, Pienza, Cortona, Arezzo and Lucca -- and many small villages, too. 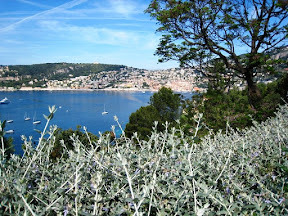 There's nothing prettier than the blue water and the villages in the South of France. We enjoyed day-hiking coastal trails with jaw-dropping views in May 2008. Another journal, rather than story.